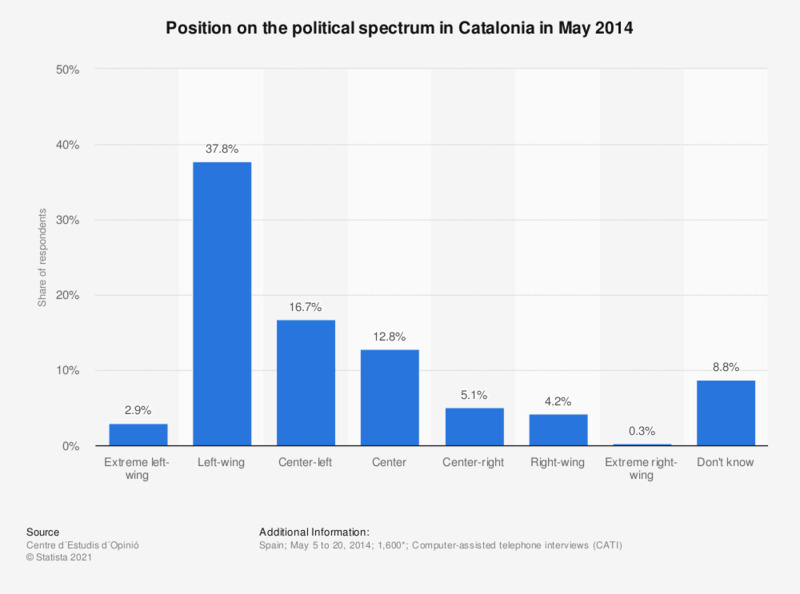 This statistic shows the political spectrum in Catalonia according to a survey carried out in May 2014. Over a third of respondents considered themselves left-wing while 57.4 percent of respondents classified themselves as extreme to center left. The share of respondents who found themselves in the center was not insignificant, but the figures clearly show that Catalonia is region in which the majority consider themselves left-wing. * Barcelona = 600, Girona = 350, Lleida = 300, Tarragona = 350. Total share does not come to 100 due to the exclusion of respondents who did not answer the question. Statistics on "Unemployment in Spain"
Do you agree or disagree that the Catalan parliament should have more power to make decisions affecting the lives of Catalan citizens? If the referendum on Catalonia becoming a new state in Europe were to go ahead, would you accept the result regardless of the outcome? Do you agree or disagree that the treatment of Catalan citizens by the Spanish government has been satisfactory? Do you agree or disagree that the best way to find out what the people want for the political future of Catalonia is through a referendum? How would you define the political situation in Catalonia? How do you rate the performance of the Catalan government? How would you define the economic situation in Catalonia? Do you think that Catalonia has improved, gotten worse or stayed the same over the last year? If the referendum on independence, planned for November 9, is carried out, will you vote? Do you believe the number of people with fascist views in the United Kingdom (UK) is increasing or decreasing?